With just one stamp and minimal bureaucracy, we left Bolivia and entered Argentina. 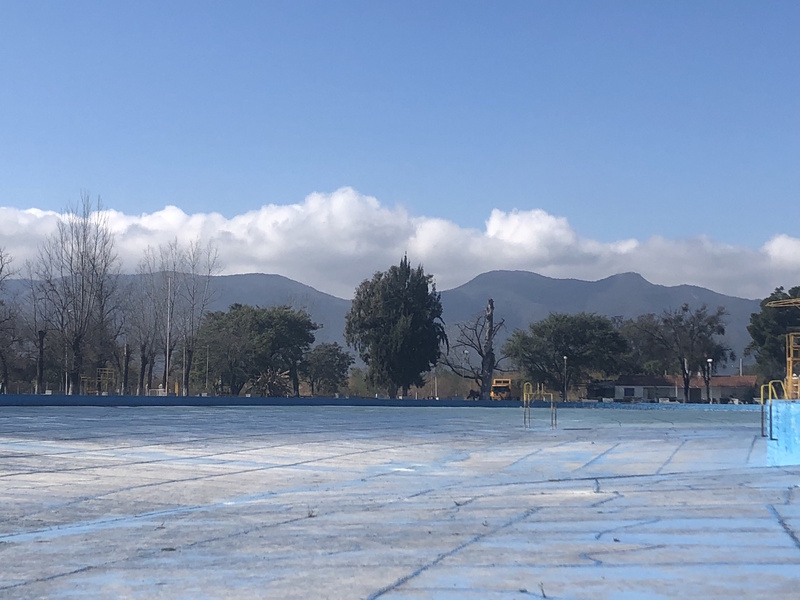 We drove down from an altitude of 4,000 metres above sea level in Potosi to just 1,100 metres in Salta, and it immediately felt warmer and easier to breathe. 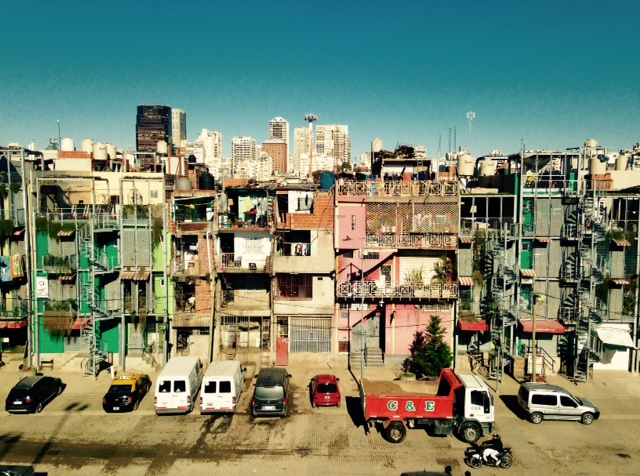 As we crossed into Argentina we noticed other differences too: cars were newer and less battered, public toilets had amenities like running water and toilet seats, and a more diverse mix of people wandered the cities. Even with Shane’s ever-so-slightly ginger hair, we no longer stood out as strange and unusual specimens. Our first stop was Salta, a pretty city with old colonial architecture in the north west of the country. 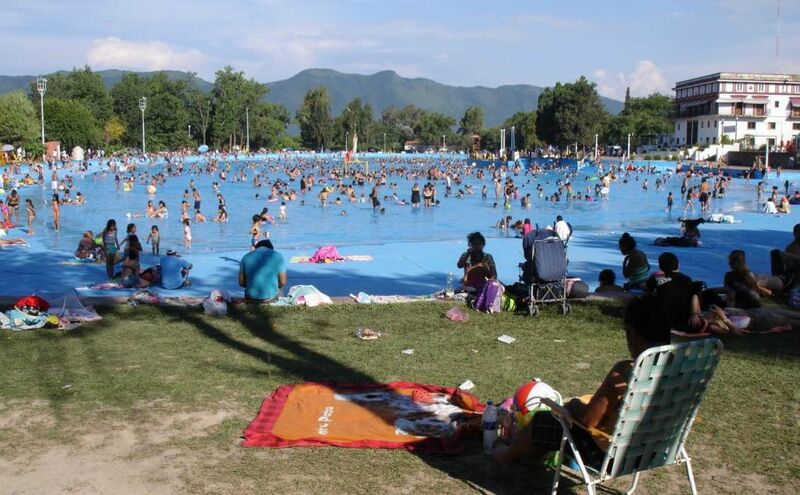 We camped at one of South America’s biggest swimming pools, which sounds more exciting than it was. While google images shows a giant swimming pool, drenched in sunshine, surrounded by greenery and filled with families and friends having fun, what we found was an eerie, empty crater. The facilities at the campsite included the worst toilets of South America so far, some old, rusty playground equipment and non-existent wifi. After several days of reasonably nice accommodation in Bolivia and the promise of more sophistication in Argentina, it was a bit of a disappointment. Being a richer country, Argentina was also significantly more expensive, and so the group’s spending power had taken a nosedive. Nevertheless, we had a good day in Salta, and journeyed to the Juramento river for a spot of white water rafting. Excited to make the most of the warmer climate, I turned up in a shorts and T-shirt, which turned out to be a dreadful mistake. As we listened to the safety briefing (all in Spanish, followed by a quick “do you need me to translate into English”, to which someone from our group unhelpfully replied “no”), I started shivering, worried about how cold I was going to get in the rafts and the water. I needn’t have worried – as well as a wetsuit, we were each given a fleece and a windbreaker jacket to wear. We met our guide, an enthusiastic man from Germany who had quit the rat race to live in the mountains and raft down the river for a living, and explained that we had managed to miss the entire safety briefing due to our failure to understand the Spanish version, and our second failure to say so. 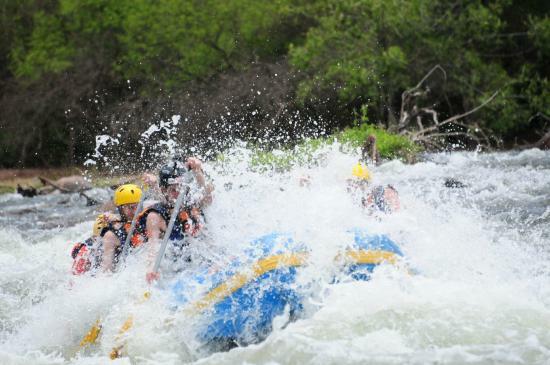 Although the rapids were “only” class III, the rafting turned out to be adventurous enough for us. We paddled through rapid after rapid at speed, and found ourselves powering down waterfalls and over rocks. At one point, Andrea fell out, but was back in the raft in no time, and at the end, everyone (except me) jumped out for a swim, while I happily stayed dry(ish) and warm(ish) in my own personal raft. After getting dry and making the most of an all-you-can-eat BBQ (which included some of the most delicious steak we have ever had), we headed back to the town center and explored the city while trying (and failing) to track down an ATM that didn’t charge an extortionate amount to withdraw a very small amount of money. With inflation of around 30% per year, the government have tried to stop people taking out large amounts of money – setting low limits for withdrawals, and adding big fees (around £10 per withdrawal) – to keep cash in the banks and help the country to stay afloat. While ATMs have big queues and big costs, exchanging money is often no easier, with more big queues and bureaucratic processes. 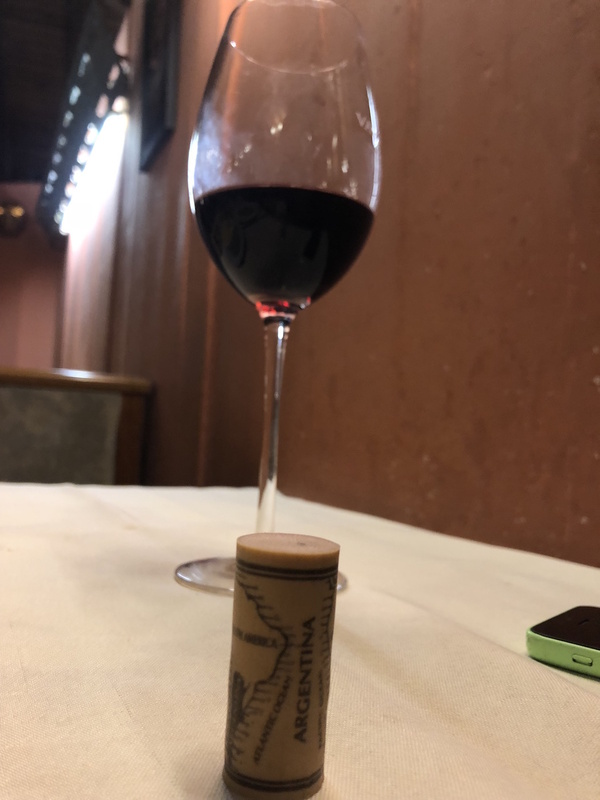 Luckily, we found a man on the street who offered to exchange his rapidly-depreciating pesos with our American dollars at a better-than-XE exchange rate; a transaction which I hope benefited him as much as it did us. From Salta we had a relatively short drive day to Cafayate, famed for its vineyards and winemaking. On the way, we stopped at a couple of viewpoints to enjoy the scenery, when driver James realized that our lovely yellow truck (Spongebob) had a problem. Spongey was leaking oil everywhere, and the official diagnosis from Shane was that a gasket between the oil cooler and the engine needed replacing. 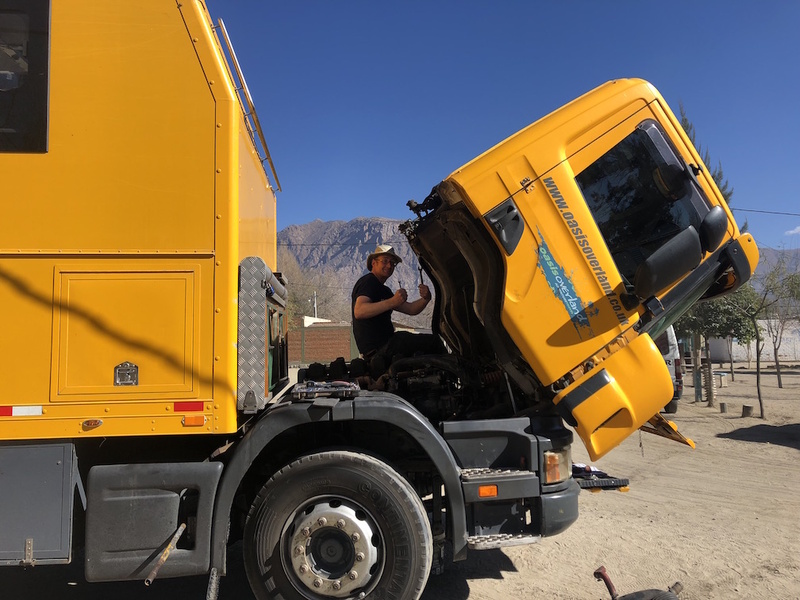 After a bit of a debate about whether to stop and fix it, or try and complete the remaining 40 kilometers to Cafayate, James decided to push on. We made it into Cafayate in one piece with the sun setting over our next campsite, and Jess and I got to work cooking paella for our group dinner. The next day, while I went off with the rest of the group to explore the local bodagas, buy some cheap wine (starting from just £1! ), and to gather picnic supplies for our planned cheese-and-wine evening, Shane stayed with James to help him fix Spongebob. They worked all day, got very oily, and at the end of the day still didn’t know whether they had solved the problem. “I think there’s a 60% chance it’s fixed”, said Shane, which seemed good enough, so we ate our cheese, drank our wine and hoped for the best. The next day Spongebob started happily and progressed all the way to Cordoba with no issues. While most of the rest of the group went skydiving, our day in Cordoba was a little more mundane. Instead of jumping out of a plane, we navigated the public bus system to head into town, got Shane’s phone fixed (his screen had been completely dead for at least a week), tried to explore the top sites (they were all closed), and tried to explore some of the town’s trendy shops and bars (they were all closed). Slightly deflated, we headed back to our hostel and went for an amazing steak dinner to cheer ourselves up. It took us two more days of driving, with a bush camp at a service station in between, to reach Buenos Aires. In those two days, I had managed to come down with a nasty cold, and so took to my bed almost immediately while the others went out exploring. 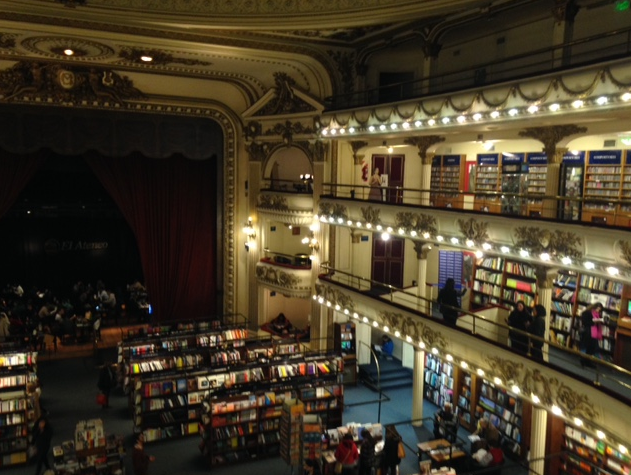 We stayed in Buenos Aires for four nights, which gave those of us who weren’t stuck in bed plenty of time to see the city. Shane, Andrea, Marisa, Holly and Ryan went for a walk to the Evita graveyard and a giant theatre which has been turned into a giant bookshop during the day, and in the evening I managed to join the rest of the group for a tango lesson, a delicious dinner of steak and unlimited wine and a very impressive tango show. The next day we said goodbye to Marisa, who was leaving the trip and flying back to Switzerland from Buenos Aires, and headed off on a day trip by ferry to Colonia del Sacramento in Uruguay. What sounded like a great way to get a taste of a new country turned out to be an enormous effort for little more than a passport stamp. We arrived at the ferry port in Buenos Aires two hours early, checked in, passed through immigration, waited for the ferry and then boarded. 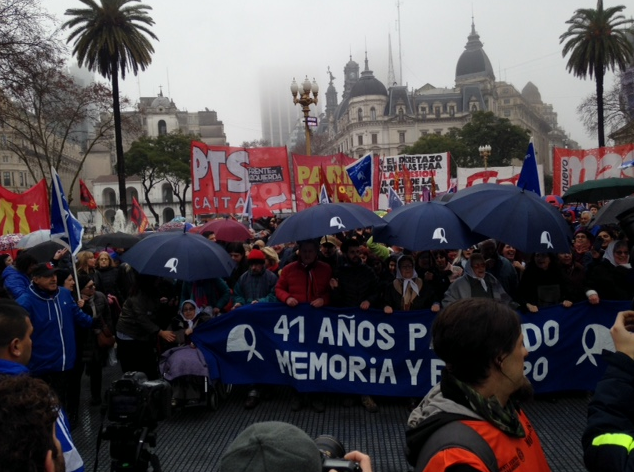 Once we arrived in Uruguay, we were greeted by grey skies and rain. We managed to survey the two main sites in the town (the lighthouse – closed, and the church – unremarkable) in about ten minutes, and then wandered around looking at the menus in overpriced cafes. Eventually, we got on a bus for a short tour of the surrounding area, where the first point of interest was identified the town’s shopping centre, and spent the rest of the day in said shopping centre, waiting until it was time to get the ferry back to Buenos Aires. We had only experienced a tiny snapshot of Uruguay, but it didn’t leave any of us feeling particularly inspired to return. In the morning we tried to say goodbye to Will, who was also flying home from Buenos Aires, but found he had already disappeared. While I continued to rest and recover, Shane headed back into the city with Andrea, visiting a cathedral and getting caught in a women’s march. In the evening we had more steak for dinner, and then met up with another Oasis Overland group. This group was also travelling from Quito to Rio, but they had started earlier than us and would be arriving later than us, because they had travelled through Patagonia. We knew the driver – Adam – as he had been the driver on our previous overland trip from London to Sydney in 2009, so it was nice to see a friendly face and catch up after nearly ten years. While Adam had enjoyed his trip so far, the others didn’t seem to be having the best of times. Tales of the freezing temperatures they endured in Patagonia and group divisions and arguments left us feeling relieved that we hadn’t chosen that particular route, and lucky that we got on with the rest of our group. 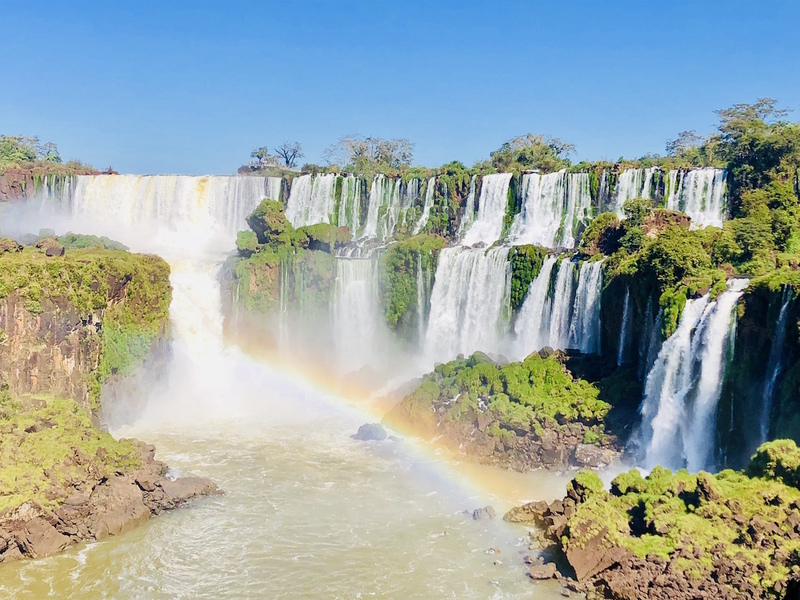 From Buenos Aires we drove north for two long days to reach Puerto Iguazu, a small town near the famous Iguazu Falls, which sits on the border between Argentina and Brazil. 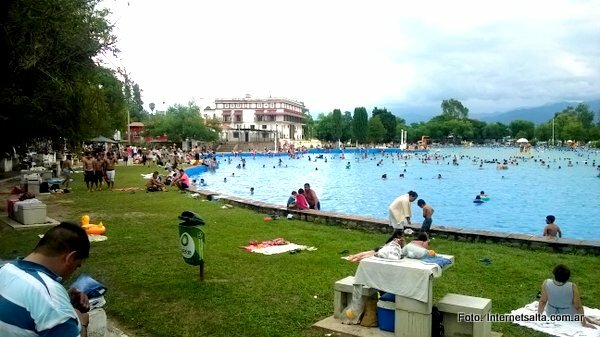 We were over 1,200 kilometres north of Buenos Aires, and the temperature change was dramatic. We peeled off our layers, Ryan cleaned out the slightly grim looking swimming pool, and we spent the evening BBQing our own delicious meat and soaking up the tropical temperatures. 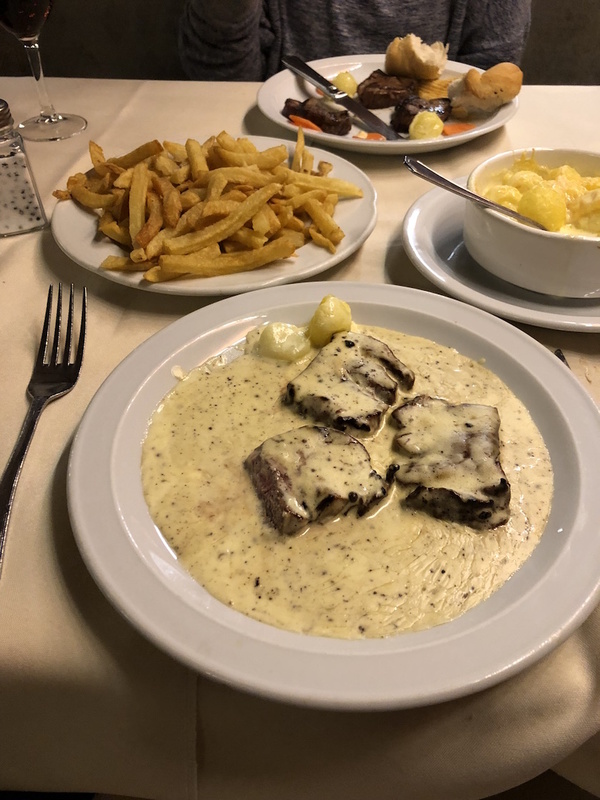 While we’d packed in several unforgettable experiences during our week in Bolivia, up to this point our time in Argentina had been a little more humdrum. 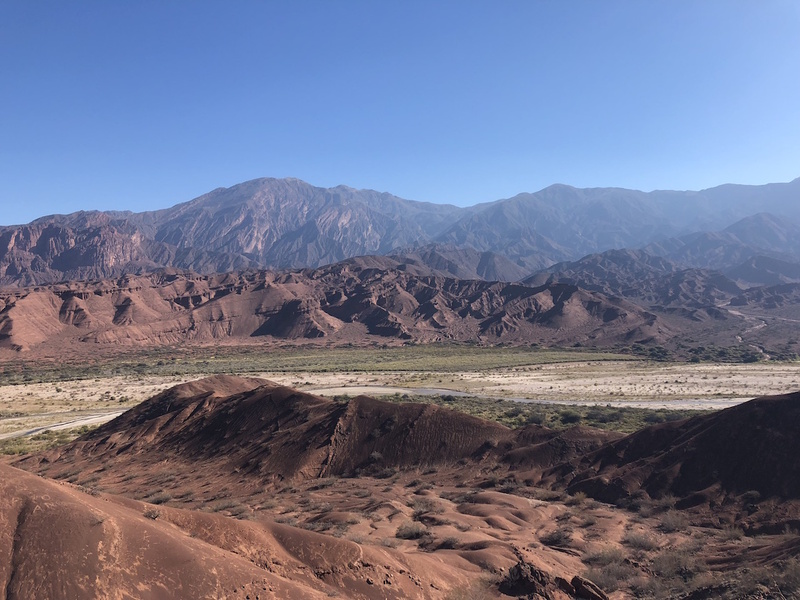 Rafting in Salta was fun, the wine in Cafayate was excellent, Buenos Aires was a lovely city and the steak was great everywhere, but we hadn’t seen or done anything truly memorable or thrilling since we left Bolivia behind. As soon as we first caught a glimpse of Iguazu Falls, that all changed. 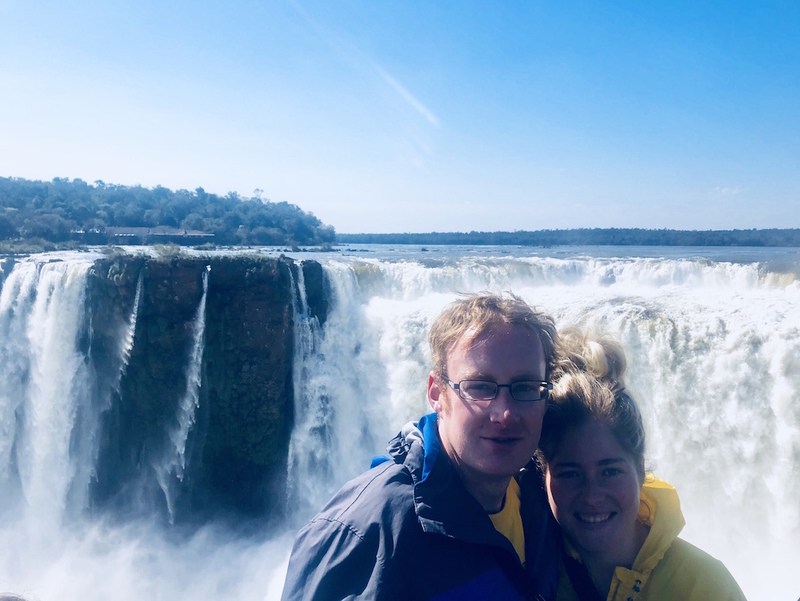 It’s fair to say we’ve seen our fair share of waterfalls – both on this trip and on others – but they all (perhaps with the exception of Victoria Falls) pale in comparison to Iguazu Falls. 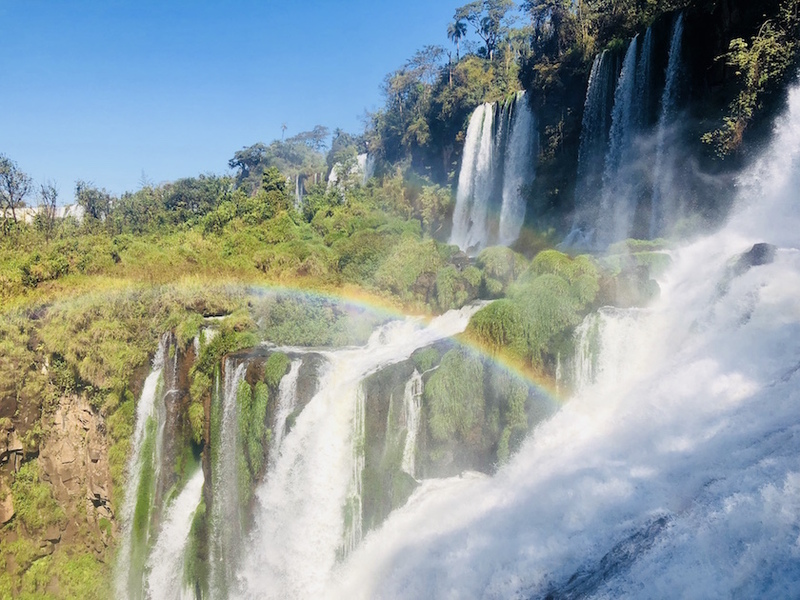 Iguazu Falls are not the tallest waterfalls, and they’re not the widest waterfalls, but they are some of the most impressive waterfalls in the world. We arrived at the Iguazu Falls National Park early, and it almost felt like being at a theme park. There were maps, a small train to take us to the sights, and little fast food kiosks dotted around. We ventured out on a giant walkway over the top of the waterfalls and peered over a viewpoint at what is known as the “devil’s throat”. The waterfalls were truly amazing from this perspective – there was water as far as the eye could see – and we walked around in awe. We spent the rest of the day wandering around the various trails in the park, taking in the waterfalls from different perspectives. It’s hard to convey the sense of scale in pictures, but we took plenty anyway, and the waterfalls seemed to go on forever. The views just kept getting better with every corner we turned. The park itself was also stunning. It was set amongst beautiful rainforest, with wildlife around every corner. 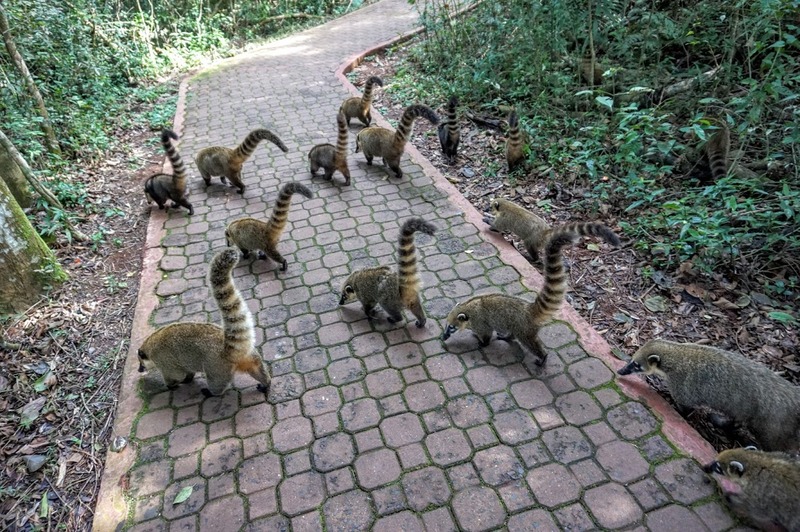 We did have to watch out for the mischevious coatis – raccoon-like animals – which might have looked cute to unsuspecting visitors but which frequently stole food and, if provoked, would bite humans and pass on their rabies. Despite the presence of the coatis, we had a phenomenal day exploring the views of Iguazu Falls. 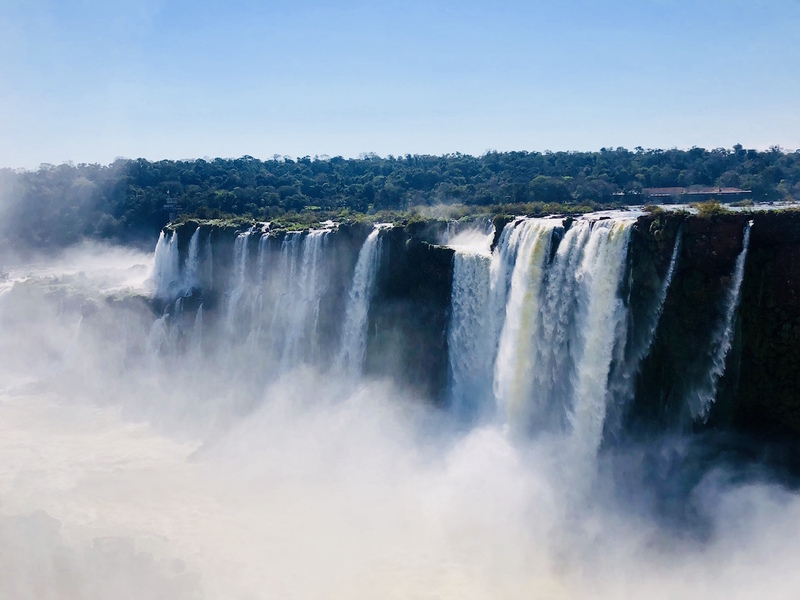 While the wildlife on the Galapagos Islands was unique, Machu Picchu was magnificent and the salt flats were out-of-this-world, visiting Iguazu Falls was the highlight of my trip to South America. 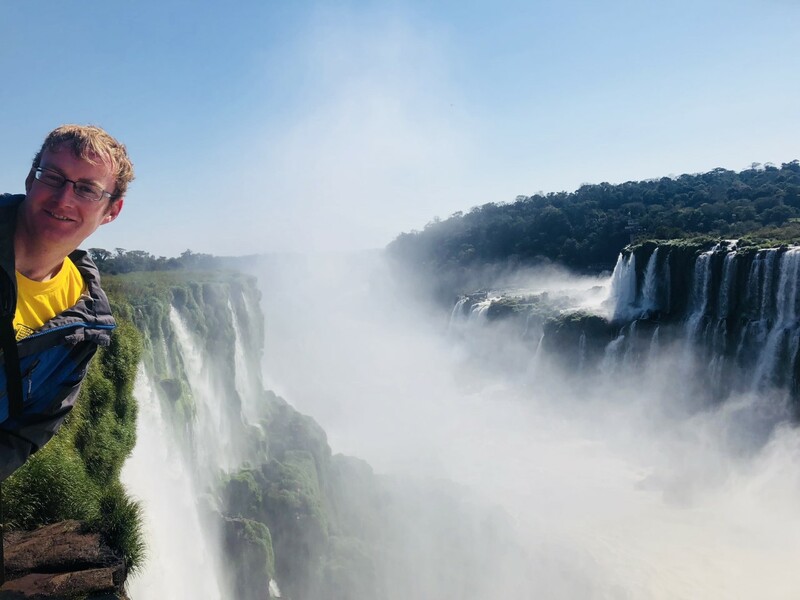 We had a blast white water rafting, learning to tango and eating huge volumes of steak in Argentina, but I must admit that I couldn’t wait to get to Brazil, just to see the waterfalls again from a whole new perspective. Thanks for letting us know Gill. Not sure what went wrong but I deleted them and added them back in and it seems to be working now!